(Bloomberg) -- China will close an industrial park in the eastern province of Jiangsu where an explosion last month killed 78 people. The Xiangshui Chemical Industrial Park in Chenjiagang will be permanently shuttered, the official Xinhua News Agency said Friday, citing local officials. Some 187 people are still in the hospital following the March 21 explosion, the report said. The blast at the Jiangsu Tianjiayi Chemical Co. prompted President Xi Jinping to order an all-out rescue effort for survivors. The incident, along with a second explosion at a metal-processing plant that killed seven people in same province, served as a reminder of China’s continuing problem with industrial accidents. 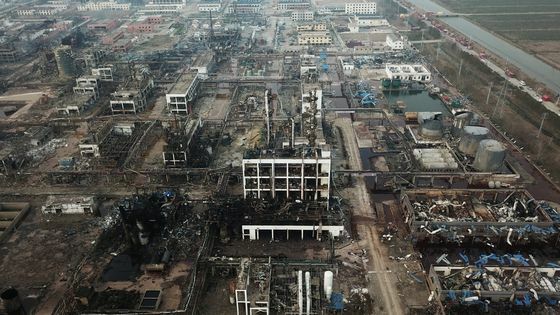 The Xinhua report said Dai Yuan, the Communist Party chief of Yancheng city, told the local government to “clean up scattered chemical plants.” Chemicals producers in the area were ordered to improve safety conditions. No cause has been given for the disaster.